This is the most faithful bastardization of a cinematic legend since the Blues Brothers-themed pigs we were briefly obsessed with in 2009. When Don Cor-loin-eone here makes some poor schmuck that offer he can't refuse, what is the nature of the proposal? The only thing it obligates him to do is eat the Hogfather or one of his lieutenants. 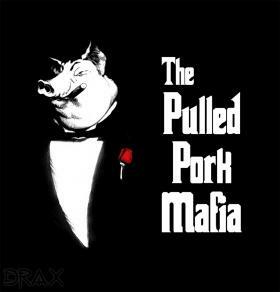 Of course, only in Suicidefood City could this scenario make sense: a ruthless, corpulent Brando-esque hog runs a criminal enterprise dedicated to the trafficking of dead pigs.